These American-style pancakes are smaller, thicker and puffier than our version. Try them on Shrove Tuesday, 4 March, or for a weekend brunch. This recipe uses Bramley apples and to find out more about this popular variety visit www.bramleyapples.co.uk. Bramley Apple Week takes place 3-9 February. Heat the butter in a small pan, add the apples and cinnamon and cook gently for 5 minutes until the apples are softened, but not broken down. Leave to cool completely. Mix the flour, baking powder and sugar in a bowl. Make a well in the centre and add the eggs, then gradually beat in the milk to make a smooth batter. Gently stir in the apples. Melt a knob of butter in a non-stick frying pan until foaming. Add generous tablespoons of the batter, allowing room for them to spread slightly. Cook over a moderate heat for about 3 minutes until bubbles appear on the surface of the pancakes. Flip them over and cook for a further 2-3 minutes, until they are risen and golden brown. Keep the pancakes covered on a plate, separated with sheets of greaseproof paper, in a low oven while cooking the rest. Add a little butter for each batch. Gently warm the toffee sauce in a small pan, or in the microwave for 30 seconds. 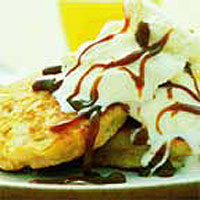 Serve 2-3 pancakes per person drizzled with the toffee sauce and scoops of Waitrose Clotted Cream Ice Cream. You can make these pancakes a few hours ahead of serving. To reheat, wrap in a foil parcel and put in a moderate oven for 10-12 minutes.